Quick overview 'Get Ready for Physics' helps science students quickly prepare for their introductory physics course, either algebra-based or calculus-based. It provides useful tools for future success in the course, gives you tips on recognizing your individual learning styles and helps you maximize your study time. Get Ready for Physics helps you quickly prepare for your introductory physics course, either algebra-based or calculus-based. It provides useful tools for future success in the course. The booklet gives you tips on recognizing your individual learning styles and helps your maximize your study time. It helps you review the basic mathematics you will need for the course, including ratios, proportions, and graphs. It gives you a bird's-eye preview of the major concepts and physical models so you start the course with a broad perspective of the key physical ideas and the knowledge of important terms that give students most trouble. 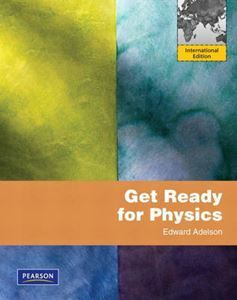 The booklet concludes with a strong chapter on solving physics problems, replete with practice problems and examples, and with insights into answering conceptual and estimation type questions.